See Kai Run is a great kids shoe company! We had the amazing opportunity to try out one of the shoes from their new fall line and I must say they are gorgeous. They have a awesome fall line one of the best yet not like the rest weren't great but I love these great styles.With these new styles and some of their older styles there is definitely a style you with love. Then with their awesome quality you will be coming back for more! We tried out Rebekah style and they are just too darn cute. She will be the hit of her classroom. I love the colors brown and pink. I love the visible stitching looking. They are tough and made of leather. The slip free soles are wonderful especially in Utah's crazy weather. I feel safe that her feet are protected and comfortable and adorable. These shoes go beyond most shoes with all the luxuries. Your kids will love them and so will you! See Kai Run is giving one of my lucky readers a pair of See Kai Run Shoes of their own. I would love the Samantha shoe in size 5! I also entered your Bumkins giveaway. 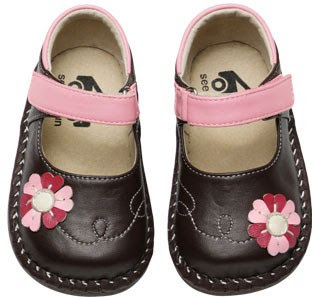 I love the Violet ones and I'd get them in a size 3.
i love them all- i would love to win the Sylvia, and i would choose a size 7 for my little girl. I love the celeste style in size 7. I'd pick the Eric in size 6. I entered the Energizer Safety Kit giveaway. I entered the Sweets 'n' Treats Cd giveaway. I entered the In Balance Pillow Protector giveaway. I entered the Smead giveaway. I entered the Bumkins Gift Certificate giveaway. I faved on Technorati (susanlanai). I entered your Pillow Protector Giveaway! Thanks! I entered your Sweets n Treats Giveaway! Elizabeth in size 6 is my pick. I'm lovin the Maverick in an 8. I would pick the Samuel in size 3! Thanks! Cute shoes! I entered your Corel Paint Shop Pro Photo Giveaway! Thanks! I would love either the Jaewon or Rebekah in a size 6. Too cute for words! I'm dying for the Elizabeth in size 5. Subscribed to RSS feed. Thanks! I would LOVE the Violet in a size 9, those shoes are fantastic! I entered your Sid the Science Kid giveaway. My favorites are the Kenso shoes, but they say they only have them in size 3 & 4, so I'd have to pick the Eric shoes in a size 9. I entered the Bumkins giveaway. OMGOSH so hard to choose!!! I love the Gavin and the Keegan and the Harry for Boys! Soooo Cute and so well made!! I LOVE See Kai Run Shoes!! I added you to my Technorati Faves! I like the Violets in a 10 please. I get your RSS feeds. I entered the Sweets n Treats Cd Giveaway! I entered your Charco Chaps Giveaway! I love the Steph in size 5!! I have your button in my scrolling marquee. I have your Back to School button! Linked up in my blogroll! I entered the Bumkins giveaway! I entered the Little Miss Matched Giveaway! I would love the Jennifer Lee shoes in a size 8 if we won! I would love to win a pair of the Samuel shoes size 8 for my son. Thanks for the giveaway. I love the Lola Shoe in size 4. I entered the O'Bon giveaway! The Coleman shoes in size 7 would be super for my son! My favorite See Kai Run style is Violet. If I won I would choose size 9. I think the Rebekah are also my favorite, but the Elise are a close second. I'd choose a size 8. I'd love the cute Eric shoes in size 7!